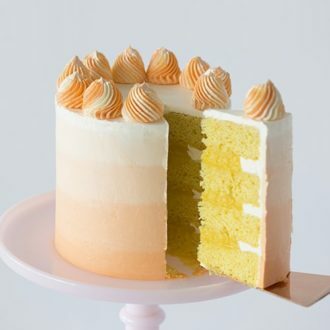 A delicious orange cake filled with orange curd and covered in a creamy ombré of Italian meringue buttercream. Whisk together sugar, cornstarch and the flour in a heavy-based saucepan. Add the orange juice and egg yolks and whisk to combine. Put the saucepan over medium-high heat and cook, whisking constantly until the mixture boils. Cook while stirring constantly, the mixture will become thicker and clearer. Allow mixture to boil for 1 minute. Transfer to a bowl, cover surface with plastic wrap and chill. Cream together the butter, sour cream, and orange zest. Slowly add the sugar, mixing until the mixture is light and fluffy. Scrape down the sides of the bowl. Add the eggs, one at a time, mixing well between additions and scraping down the sides. Add the sifted dry ingredients alternately with the orange juice to the creamed mixture, beating well on low speed after each addition. Pour equal amounts of the batter into the two prepared cake pans. (I also use cake strips on my pans for more even baking.) Bake until a toothpick inserted in the middle comes out clean, about 22 min. Cool the cake layers in the pans for 10 min. and then loosen the layers by running a knife between the cake and the edge of the pan. Remove the layers from the pans and put them on a rack to continue cooling. Beat the egg whites and 1/3 cup of sugar until soft peaks form. In a medium saucepan add the remaining sugar and 1/3 cup water then place on low heat. Stir constantly until sugar melts and becomes clear. Maintain at medium high heat until temperature reads 235-240F. Run mixer until meringue is body temperature. Add salt. I used an 869 tip to pipe the dollops, froze them, and then placed them on top. I divided my buttercream into several batches and added varying amounts of food coloring to create an ombre effect. If you’re not using 6-inch pans, double the recipe for 8-inch pans or triple the recipe for 9-inch pans. If you see little clumps of butter after you mix the wet ingredients don’t panic, it all works out by the time you mix in the dry ingredients. You can even use melted butter and warm the milk and sour cream up a bit if you like. To get FLAT layers that are moist inside and out try using cake strips! You can buy a set online or make your own from foil and paper towels at home. I made a whole blog post on it so check it out if you’re interested! If you don't want to make Italian buttercream you can use the American variety. I just prefer the smoothness and taste of the Italian variety. I know it's a pain to make two different types of frosting though!